When you volunteer in Second Harvest’s nutrition programs, you not only help the community, you become part of a community. The Nutrition Ambassadors who distribute food and produce throughout Santa Cruz County become a team of friends, and this month we’re spotlighting one of the volunteers who brings a lot of spirit to the team. Efrain Cuadros began helping out over three years ago at the Church of the Nazarene, registering clients and helping the distribution run smoothly. Ever since, he has been a Nutrition Ambassador with our Passion For Produce program, promoting healthy eating and getting nutritious foods to the people who need them. And Efrain understands the need—he used to come to the sites himself when he had trouble obtaining enough healthy food. Now Efrain is leading distribution sites and recruiting other participants to join our Nutrition Ambassador team. “I hope that my volunteer work we can help end hunger in our county,” Efrain said. Besides his dedication, Efrain is also known for bringing in fresh fruits grown in his own garden to share with other volunteers and participants, brightening the distributions and bringing joy to those around him. 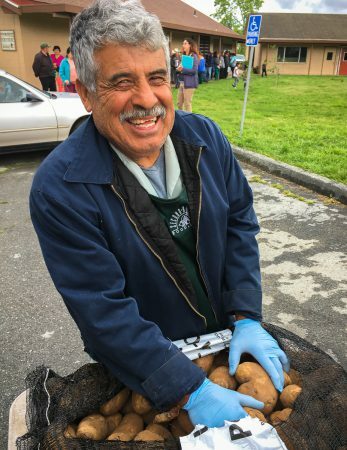 It’s volunteers like Efrain who bring community to volunteering, and change to the community.